If you’ve ever taken a long plane trip, chances are you’ve slept in or at least considered sleeping in an airport at some point. For long trips and flights with extended layovers, sleep can even become a necessity if you want to keep your sanity. However, in busy public places, sleeping can require a bit of finesse and planning if you want to get quality Zzz’s and stay safe. The upside is that you avoid dealing with cabs and hotels for just a few hours of rest, saving you money and stress. Below we’ve put together 15 useful tips for sleeping in airports when travelling, along with some of the world’s most sleep-friendly airports to plan your layover in. When it comes to snoozing in a busy hub like an airport, the key things are minimizing environmental disturbances, while also keeping yourself and your belongings secure. From where to sleep to what to bring along, rest easier in airports by incorporating the following tips. 1. Find out the terminal’s hours. While most major airports are open 24/7, smaller airports or certain terminals could shut down at night. Check the airport’s website or call an agent to check the hours so you are prepared, especially if you have an overnight layover or expect other delays. If the terminals do close early, some airports may allow you to rest near public baggage claim or check-in areas, but know that these zones are less secure. Have travel tickets and ID on hand to show you have a valid reason to be napping there. 2. Seek out a lounge or designated sleep space. The ideal way to sleep in an airport would be to take advantage of designated sleep-friendly zones, if available. Some airports feature pay-per-use sleep pods or mini rooms that provide dark, quiet and privacy for comfortable rest. Other airports have lounge areas (usually requiring a small entry fee) that may have fold-down seats or more comfortable areas for snoozing. 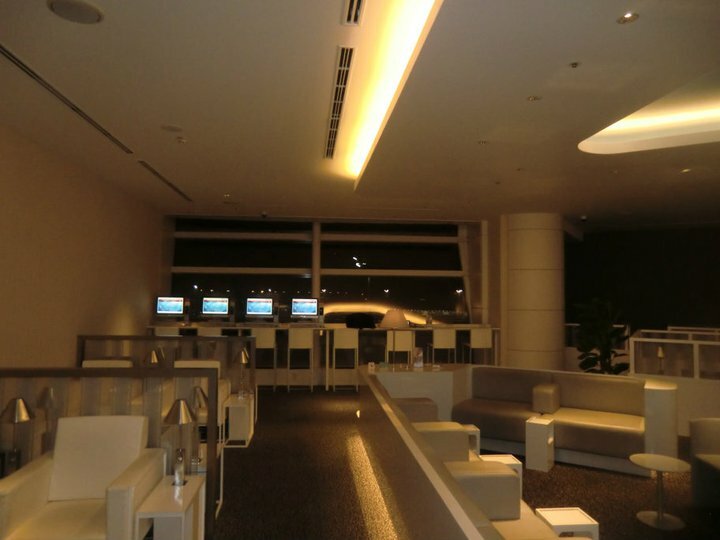 Lounges are also usually staffed and more secure than general seating areas. 3. Rest nearby other travelers who are sleeping if possible. If there are no specific sleep areas and you are travelling alone, your next best way to sleep in an airport would be to rest near areas where other people are also grabbing some shuteye. You are safer in a group, and people are less likely to disturb you. 4. Rest in areas with frequent security or employee traffic. Stay within the secure terminal zones if possible. Look for areas to sleep that are near guards, areas that have frequent employee traffic or at least some security presence like cameras. Areas near staffed gates or security desks and checkpoints are preferable to isolated areas in terms of security. While being all alone might seem best for snoozing, you don’t want to entirely isolate yourself as that could make you more of a target for shady characters. 5. Check the traffic times. If you are planning on getting a full night’s rest, check the departure boards to see when the first flights will be taking off. Opt for a gate that gives you enough time to sleep so you won’t be disturbed mid-snooze, or be in the way of other passengers. 6. Pick a comfortable spot. In most airports, you have to two options: sleeping on the bench seating, or taking to the floor. You may need to explore a few gates or terminals to find the right spot. The best bet would be armrest-free rows of seating or recliners you can stretch out on. If you can get comfortable upright, you can also kick back on the regular seats and prop your feet up on your bag. If the seating situation isn’t optimal, you can wrap up in your hoodie, use your bag as a pillow and stretch out in a clean place on the floor. Opt for a place near a wall so you’ll be out of the flow of traffic. 7. Ask for a blanket or cot if you have a long layover. Many airports have cots on hand for large flight cancellations. If you have a long layover and the seats aren’t comfortable, politely ask an attendant if they could let you use a cot. Most airlines also stock blankets for plane passengers, and may grant you one if you ask nicely. 8. Minimize the baggage you are carrying. Minimizing what you have to lug around not only makes flying easier, it also make sleeping in airports easier. Check big bags and try to limit carry ons to a backpack or messenger bag that you can easily watch out for when resting. Some airports also offer small lockers for temporary storage, which can be a helpful place to store carry on baggage while snoozing, especially if you are travelling alone. Fewer things makes you less of a target for thieves and can make it easier for you to relax. For connecting flights, your baggage will generally be held but if it is going through baggage claim, don’t leave security to pick it up. The baggage office will hold it for you, and if they contact you, you can tell them you’ll be picking it up in however many hours. 9. Recline with bags and valuables near or touching you. If you can’t or don’t want to stow your bags, be smart when you sleep. Using your bag as pillow or footrest serves two purposes — comfort and security. For messenger-type bags, backpacks and purses, place a strap across your torso so it’s not easy to remove or tamper with. Smaller, softer bags can easily double as pillows. Plant phones, iPods and wallets somewhere on your person that would be hard for a passerby to access. For larger bags, consider putting them beneath your feet or having a strap around a leg or arm. The goal is basically to deter anyone from disturbing your bag and to be alerted if someone does. 10. Eat light and stay hydrated. Airport food courts often serve up fast food favorites like pizza and fried foods, but it’s best to keep your meals on the lighter side if you plan on grabbing a nap. Greasy foods can cause indigestion and bloating, making it hard to get comfortable. Carbohydrates and small amounts of protein are good for sleep, so grab a fresh sandwich, a light rice bowl, or even some trail mix or protein bars and a banana instead. Skip the caffeinated tea and coffee since flying is dehydrating, and opt for plenty of pure water instead. 11. Bring an eye mask or lightweight scarf. Airports are typically bright 24/7. Use an eye mask, hood or light scarf to cover your face. Dark sunglasses could also do the trick. 12. Bring earbuds and music or ambient noise apps. Unless you’re the type who can fall asleep during a concert, you’ll likely want to toss some earbuds, headphones, or ear plugs into your carry on bag. Have a few calming playlists or apps that play ambient noises downloaded before you travel. Also, it’s a smart idea not max out the volume when you’re resting in an airport. You still want to be aware of your surroundings! 13. Wear comfortable clothing and shoes. When flying, it’s always wise to wear comfortable clothing and shoes — even more so if you plan on sleeping. You don’t want to feel self-conscious and stiff when trying to relax and you can’t exactly change into pajamas. Wear a couple of layers, such as a t-shirt and a wrap or a hoodie. Airports are generally cooler, therefore you’ll likely want something to snuggle up in. Opt for looser, stretchier fabrics that you’ll feel cozy reclining or lying down in and shoes you don’t mind leaving on. 14. Set an alarm on your phone that you will wake up to. 15. Bring a few basics for freshening up post-nap. A few airports have pay-per-use lounges or gyms with showers, but many simply have bathrooms. Pack a few hygiene must-haves in your bag such as face cleansing and deodorant towelettes, a comb, dry shampoo, a travel toothbrush and toothpaste, and any makeup essentials to ensure you aren’t feeling grimy on your next flight. If you have to sleep in an airport, why not look for the best? A few hubs of airline travel have gone out of their way to make flying more comfortable, including amenities ranging from private sleep pods to full service spas. Here are fifteen of the best based on Sleeping In Airports polls and traveler reviews online. The Sky Harbor airport in the heart of Phoenix, Arizona is large and clean. The gates’ padded seats are free of armrests making them sleep friendly, and there’s also free Wi-Fi if you get bored. Terminal 4 Baggage Claim restrooms have showers, and there are several lounges and kids’ play areas. Orlando, Florida’s airport features several comfortable seating areas perfect for sleeping, including several with nearby charging stations, which are convenient. There are also plenty of benches and dimmer areas, and there is a Hyatt hotel inside the airport for those who want more privacy and amenities. Travelers in Philadelphia, Pennsylvania’s airport like the older B and C terminals as they have well-padded seating without armrests that offer a comfortable snooze spot. One thing to note is that this airport is said to have a loud PA system, so be sure to grab your earplugs. The attached Marriott also offers a handful of hourly-rental Minute Suites with private beds, TV and Wi-Fi. Malaysia’s Kuala Lumpur airport takes visitors on a walk through the forest, and also offers plenty of comfortable resting places. Armrest-free gate seating and a rest zone with reclining loungers provide plenty of places for getting comfortable. The hotel also has a gym with showers, luggage storage and spa amenities. The airport in Minneapolis, Minnesota features armrest-less chairs in Concourse D and is reportedly accommodating to airport sleepers during weather delays. You can also lounge in a quiet seating area above the Airport Mall. The airport features free Wi-Fi and charging, luggage storage, children’s areas, and a spa with shower access. Switzerland’s Zurich airport features trendy, armrest-free seating and an atmosphere that travelers find appealing and calming. This airport also has family centers with cribs and beds for parents, rest lounges, and sporting activities. This well-designed airport in the Netherlands boasts designated rest areas with modern lounge seating as well as benches and armrest-free gate seating. It also offers pay-per-use sleep pods, TV lounges, free W-iFi and entertainment activities. Tokyo, Japan’s Haneda airport is liked by travelers for its cleanliness, free Wi-Fi and showers. Padded benches and armrest-free seating can make for comfortable rest, though public and private lounges and attached hotels are perfect for people who prefer more privacy. In addition to enjoying the largest IMAX screen in the world, you can also get some good shuteye in the Hong Kong airport. Gate seating is armrest-free and there are plenty of lounge chairs around. Lounges offer private sleep spaces and a few showers. Dallas, Texas’s large airport boasts a range of amenities including lounges, private sleep pods, two attached hotels, free Wi-Fi and mobile charging, and more. The hourly-rental Minute Suites in Terminal D grant you a private room with a TV, bed and shower access. There are also large leather armchairs in certain areas, and travelers report that the airport is very accommodating when weather strikes and causes delays. Vancouver, British Columbia’s modern airport offers plenty of armrest-free seating near gates in addition to reclining seating and movable plush lounge chairs. Pay lounges offer amenities, resting rooms and showers, an attached hotel offers a fitness center, and luggage storage keeps bags out of the way. If you like to relax to television, you can also enjoy several TV lounges. Germany’s Munich Airport features comfortable gate seating as well as designated relaxation areas with spacious, plush chairs and recliners. For added privacy, you can also rent Napcab sleep cabins by the hour in Terminal 2, which have a private bed, controllable lighting, Wi-Fi and device charging. The Finns get sleep! The Helsinki airport features a range of options for the tired traveler, including armrest-free gate seating, reclining loungers and designated relaxation areas, as well as pay-per-use sleep cubicles for more privacy. 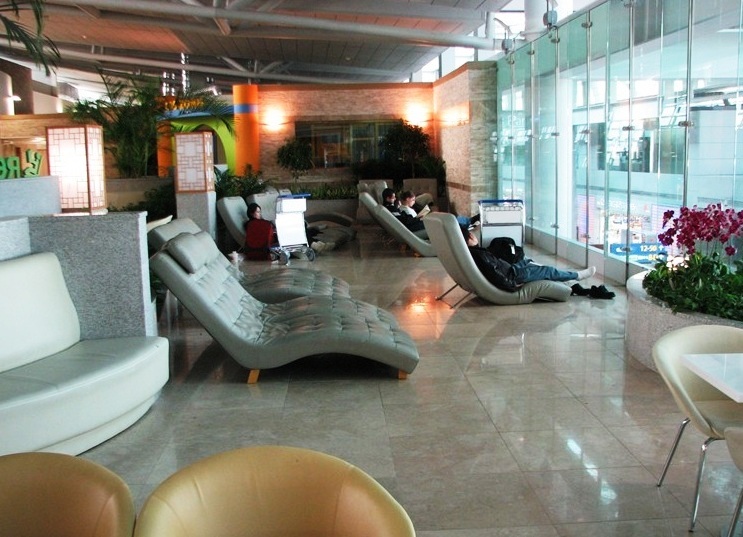 The Incheon airport in South Korea’s capital city is known for having plenty of sleep-friendly seating, clean surroundings, entertainment options and good customer service. Both designated sleep spaces with recliners and armrest-free gate seating can be found. Changi Airport in Singapore consistently tops best airport polls for a reason. This airport boasts resort-like amenities including a fitness and spa center with showers, plus entertainment venues, lounges and plenty of mobile charging areas. Changi also features six designated sleep areas with reclining seating and armrest-less gate seats. Did your favorite airport make the list? Share your best airport sleep hacks and travel tips below!